Is there anything sweeter than a library made from ice cream buckets? Yes. One whose facade spells out “books are the windows to the world” in binary code. Add a community space that has been created to help raise awareness of plastic waste and it’s a sweet recipe for a better future. The books are the cherries on top. 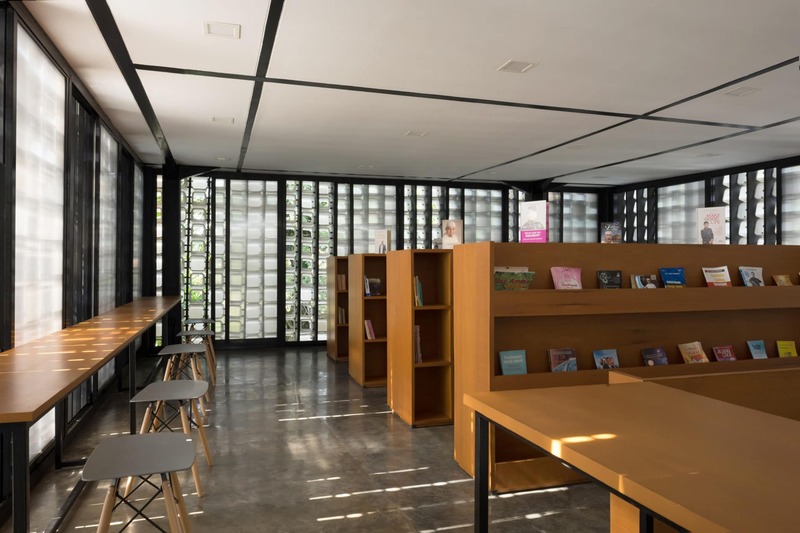 In the heart of the city of Bandung in Indonesia, Dutch architecture firm SHAU has created a ‘Microlibrary’ above a stage in a small square – to encourage people to hang out and develop a love for reading. 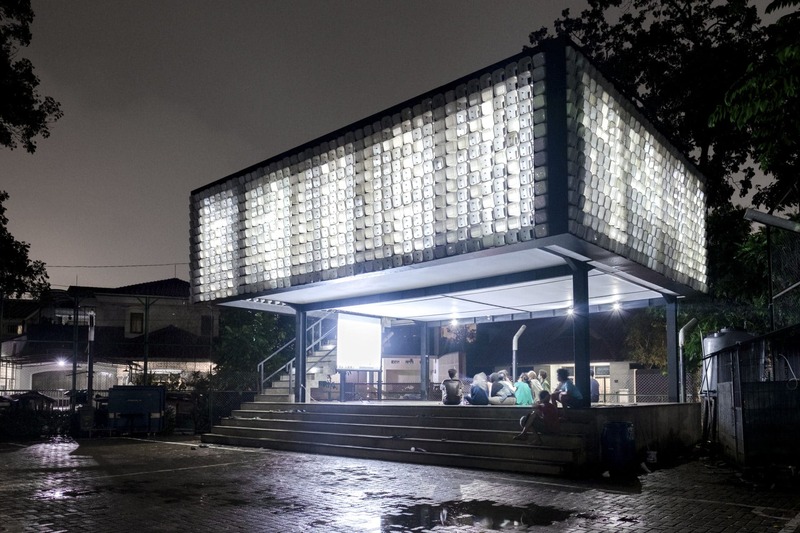 As well as being a resource of books, the floating box shelters and shades the community area from the country’s tropical climate. And the whole thing is made from upcycled plastic containers. Having always focused on creating socially and environmentally sustainable and innovative projects, this is SHAU’s first foray into the world of education. 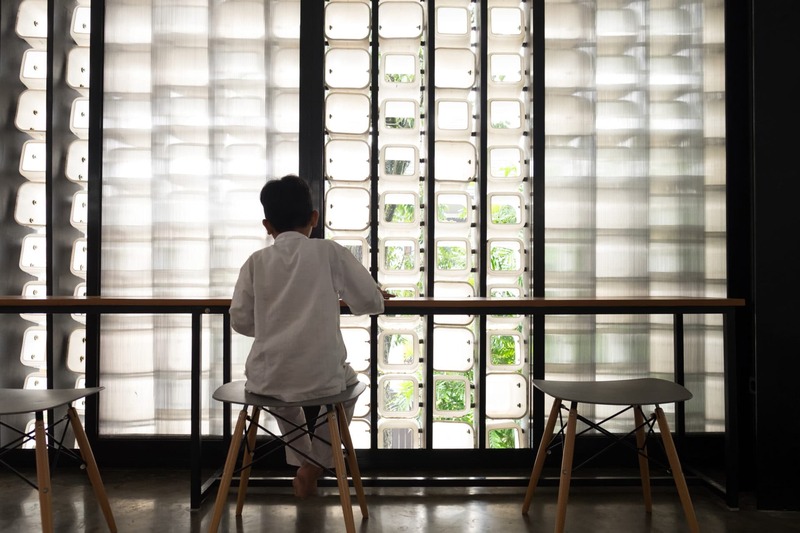 Their aim is to combat Indonesia’s high illiteracy and school dropout rates by creating a series of low-cost cultural facilities around the country. SHAU are Indonesia-born Daliana Suryawinata and German Florian Heinzelmann. The married couple met while studying at the Berlage Institute in Rotterdam, Netherlands. There they learned that spaces have a tremendous impact on society. Interested in the problems that Indonesia faces – such as infrastructure, flooding, environment and rapid urbanisation – they moved to the Southeast Asian nation in 2015. As well as causing issues with public health and flooding, the plastic waste problem in Indonesia is especially severe as the country is dependent on income from tourism, yet soils its own beaches. The ‘fun fact’ that the library’s exterior is made from 2,000 ice-cream buckets offers an entry point for discussing plastic garbage problems. What’s more, the facade’s pattern of open and closed translucent tubs is not random. 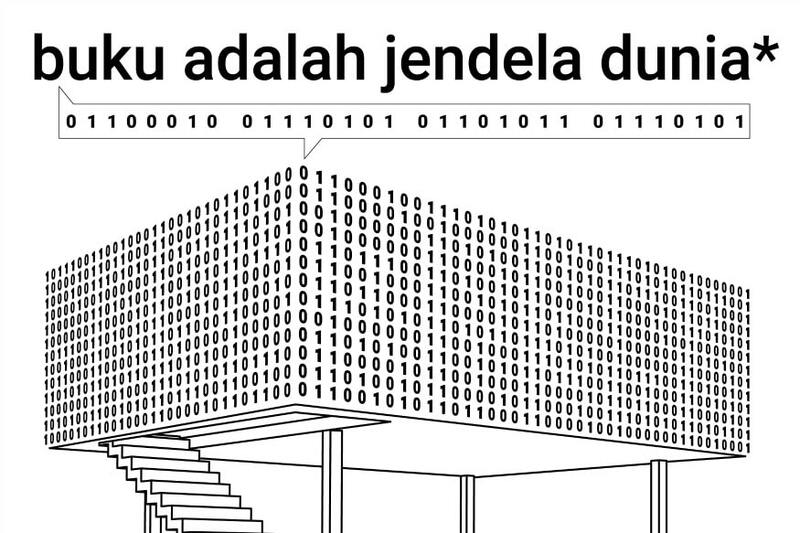 They have been arranged in binary code – as zeroes and ones – to encode a ‘secret’ message. 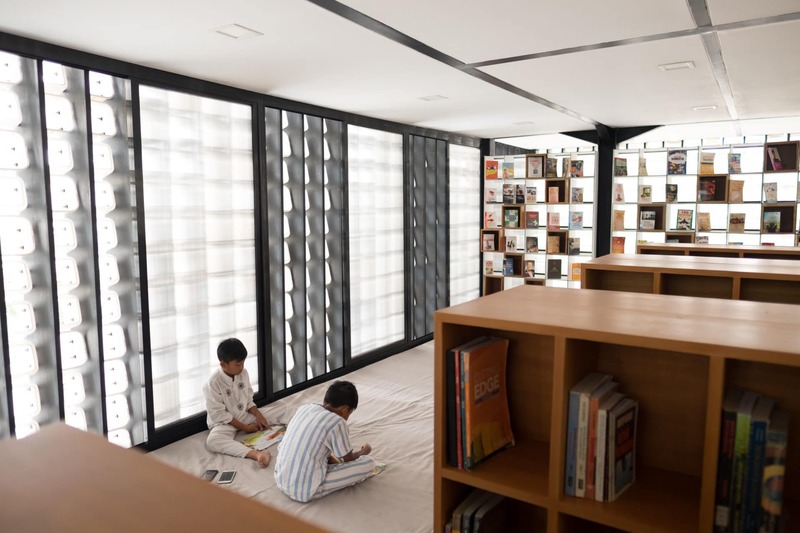 Bandung’s forward-thinking Mayor Ridwan Kamil, who is one of the patrons of the project, supplied the meaningful inscription ‘buku adalah jendela dunia’ (Indonesian for ‘books are the windows to the world’). SHAU is aware that in Indonesia their projects require a “top down and bottom up approach”. As much as you need the support of a local leader to make sure that a project is running well from a legal and administrative standpoint, it’s vital to talk and listen to the local people. While SHAU’s mission is to rekindle interest in culture, the team has witnessed how urban spaces have the power to enhance or deny interaction among people. And there’s nothing vanilla about that. AtlasAction: SHAU would like to create an organisation to support development and outreach for Microlibraries. They are looking for dedicated people in Indonesia and abroad to help finance, and build up and maintain the libraries. Tags: Accessibility, Architecture, Awareness raising, Communication, Community, Construction, Culture, CultureFutures, Education, Empowerment, Information, Media, Students, Youth.